Are the diff covers different on a 2017 Rubicon front ant rear? All Jk rubicons are the same with the exception of recons have up graded diff covers. Depends on if it's a sport or Rubicon. The sport has different front and rear for Rubicon are the same. [LEFT]so any aftermarket diff cover will front and rear. If it is for a Dana 44. Look at the manufacturers website. It will tell you. Rubicon is the same front and rear. 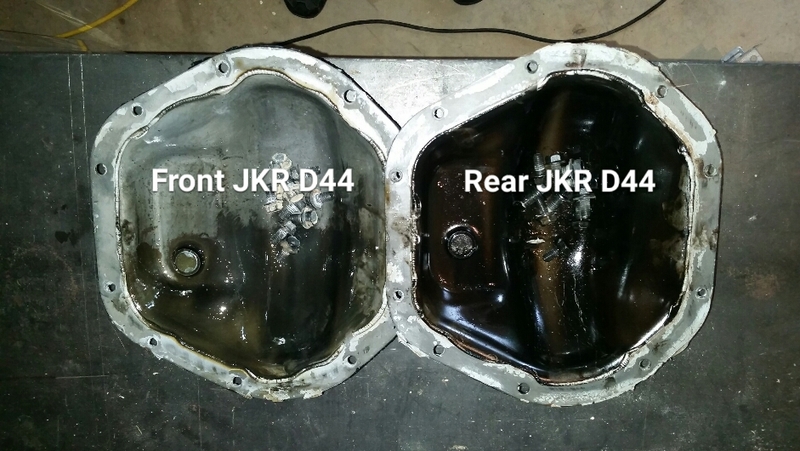 Dana 44 diff covers will work. I'd recommend Poison Sypder or Metalcloak. Cheap but effective insurance for your diffs. The factory diff covers on my 2014 Rubicon were different front & rear. They have different fill plug locations. Some covers, like the AEV ones, actually take this into account. I misread his post I thought he was asking if the 2017 covers were any different then any other year not front to back. Aftermarket covers seem to be the same, which makes filling with the correct amount of fluid trickier. The factory covers are different due to fill hole location. I have a '15 JKUR. Replaced with ruffstuff diff covers, both are the same. They are 3/8" thick, welded on both sides. Front has kissed many rocks, no leaks. Lifetime guarantee. Just curious - is the fill hole location different purely to allow for more oil in the rear diff? Why would it need that if the rest is the same? The front and rear axle are not the same. The front axle seals are located in the differential housing. The outer axle bearings are sealed units that mount to the knuckle/spindle that's attached to the axle tube by ball joints. The rear axle seals are at the ends of the axle tubes. The outer bearings in the ends of the axle tubes are bathed in the same gear oil as the rear differential. I think the gear oil is supposed to be about 1/4" deep in the rear axle tubes. The main difference is the front axle is a steering axle with u-joints at the ends of the axles. That's why the front takes less gear oil. It would be interesting to see the relative pinion angle front and rear. If you tip the pinion up, the fill hole drops down. That could be why the rear has a higher fill plug location.